dull at times. Nevertheless, when the material is of a poetic nature, McGrath shows his capacity for lyrical description. Particularly poignant is his discussion of Lewis’s A Grief Observed, which contains some of Lewis’ most raw and uncensored reflections on pain and suffering, following Joy’s death. Towards the end of the volume a sense of wistfulness is introduced when McGrath reveals Lewis’ letter to the Nobel Committee, nominating J. R. R. Tolkien for the 1961 Nobel Prize for Literature. The letter was discovered after January 2012, when the archives were finally opened to scholars, after a fifty-year embargo. We may note that the friendship with Tolkien is well documented. Even if Lewis regarded Tolkien as one of his “second class” friends, McGrath’s decision to insist on this relationship is warranted considering how influential Tolkien was in shaping Lewis’ understanding of the Christian faith at the time of his conversion. But while we are on the relational front, we may note a few puzzling omissions. First, the relationship with Hugo Dyson seems to be under McGrath’s biographical radar. No clear explanations are given as to why Dyson plays such a minor part in the narrative. More significantly, however, is the near absence of George MacDonald. Given the lasting influence he is known to have had on Lewis, the omission is all the more surprising. On the subject of omissions, Lewis scholar Jerry Root notes McGrath’s “glaring lack of appreciation for how Lewis carefully selected literary genres to suit the material he wished to present”. He is referring particularly to McGrath’s reading of Lewis’ Surprised by Joy. Indeed, McGrath seems to have applied a psychoanalytical hermeneutic, speculating on Lewis’ repressed memories and psychological hang-ups, which arguably makes for a strained reading of Surprised by Joy. At various points, McGrath seems puzzled by what Lewis includes and leaves out of his autobiographical account. But, as Root observes, “his goal was not to give a comprehensive account of his life, but simply to tell the story of his conversion.” If this is true, one may need to look closer at Lewis’s account to discover a much more purposeful selection and literary technique than McGrath imagines. McGrath’s treatment of the Joy Davidman episode in Lewis’ life will surprise, if not shock viewers of the admittedly saccharine cinematographic rendition in the Shadowlands. The relationship with Davidman has bewildered and miffed Lewis’ closest friends and, later, his biographers. McGrath makes no exception. Up until the final period of Joy’s life, the relationship is cast almost entirely in a negative light. For a biography that seeks a critical distance from its subject matter, the moral judgments that underlie some of McGrath’s descriptions of Joy and her relationship with Lewis create a strange tension. It is worth giving an example, and a significant one at that. McGrath quotes Davidman’s younger son, Douglas Gresham, to make the point that his mother’s specific intention for going to England was “to seduce C. S. Lewis.” But as Gina Dalfonzo notes, McGrath has missed the tone of Gresham’s remark and is guilty of perpetuating an inaccuracy. The quote from Gresham reads as follows: “She was not above telling nosy friends that she was going to England to seduce C. S. Lewis.” This is quite clearly a jocular remark, not uncharacteristic of Davidman. Sadly, this is but one example that shows McGrath’s particularly negative appraisal of Davidman and her relationship with Lewis. When McGrath finally mentions the love between the two and Lewis’ searing pain at her loss, the reader cannot help feel slightly detached emotionally. Could this be traced to McGrath’s failure to convey vividly enough Lewis’s psychological and emotional development in relation to Joy Davidman? What is undeniable is that, sadly, the reader struggles to empathize when McGrath offers a description of Joy’s final moments and Lewis’ ensuing pain. Finally, one cannot shake off the impression that the biography has been shaped to a large extent by marketing concerns arising from the ‘Lewis phenomenon’. In particularly harsh words, Arend Smilde, a Dutch translator and editor of Lewis’ works, goes so far as to say that the book is just “an extended contemporary comment on the Lewis phenomenon disguised as biography”. That is clearly an overstatement, which implicitly raises the question of the nature of a biography. McGrath has clearly delineated his aims and methodology from the very beginning. Lewis is best remembered as the author of the Chronicles of Narnia and as an able Christian apologist. Therefore, the decision to devote ample space to these dimensions of Lewis is understandable. The criteria for selecting what to include, what to leave out, what to focus on, and what to simply mention in passing is legitimate. Nevertheless, one may still wish for an account that touches all the important bases. Fans of the Ransom Trilogy, for example, might be disappointed given the scant treatment it receives in McGrath’s biography. The Narnia books are clearly, and understandably, the stars. All in all, while C. S. Lewis. A Life is by no means the definitive biography–can there be one?–it is an excellent introduction to the life and thought of C. S. Lewis, a man of penetrative intelligence and boundless imagination. Root, Jerry. “Does C. S. Lewis Have Something to Hide? Or is Alister McGrath’s biography too preoccupied with what Lewis declines to reveal?” Christianity Today, 22 November 2013. Web. 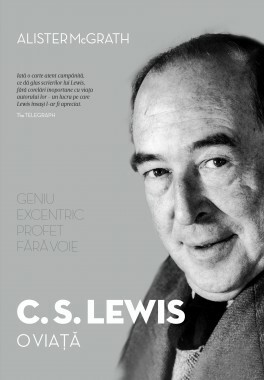 http://www.christianitytoday.com/ct/2013/november-web-only/does-c-s-lewis-have-something-to-hide.html. Accessed 28 October 2014. Dalfonzo, Gina. “C. S. Lewis’s Joy in Marriage. What I think Alister McGrath got wrong about Lewis’s wife, Joy Davidman.” Christianity Today, 8 October 2013. Web. http://www.christianitytoday.com/ct/2013/october-web-only/cs-lewis-joy-in-marriage.html?paging=off. Accessed 28 October 2014. Smilde, Arend. “Critical Notes on McGrath’s Biography of C. S. Lewis.” Lewisiana. Web. http://lewisiana.nl/mcgrathbio/. Accessed 28 October 2014.